Blue | Technology | The sociology of information technology. The sociology of information technology. I feel so sorry for having been gone for a long time. I have an entirety of reasons but its romantic to say, I got hired. Nevertheless, I had no plans of closing this blog. I will continue and we will go forward. We will advance. Speaking of advancing, I myself have acquired new gadgets that I also plan to cover in this blog. Expect Macs, OS X apps and Iphone to be included in my future posts. It is but fair I cover them, right? So, we are not just Windows we’re Apple too. Thanks. I hope I still have your attention. I’ll try harder this time. As I was fixing a computer lately, I was reminded of how other IT folks just love disabling msconfig in windows. msconfig is a simple utility on our Windows OS that takes care of the startup process, available on Windows Xp and Vista (just type msconfig on run command bar in Xp or at Start Search box at the orb on Windows Vista). It’s part of Windows installation, no need to download or install it. The power of msconfig lies on its capability to aid us in troubleshooting start-up issues and allow us to handle what applications should run and should not at boot time. 1. Normal Startup – all drivers and services are loaded, microsoft services and third-party services. This is the default. 2. Diagnostic Startup – load basic devices, drivers and services only. usually, those that are only needed to fire up your PC. Used when troubleshooting start-up issues. 3. 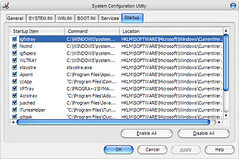 Selective Startup – more specific choices what to load on boot up, you can load system services only, startup items only (those that you allow from the startup tab on msconfig), original boot configuration only, or all of three. also used when troubleshooting issues on boot up. At this point, you might be starting to wonder, and may be asking, what about msconfig? why the hell should I care? For one, there are lots of IT guys out there who love to disable this permanently as part of their fix. That is want I rant about. Some people love to disable msconfig to make the system run and feel faster, but that is thwarted, that is faking. When our OS lags, this might be a result of many reasons. One could be lack of resources, i.e. memory, disk space, processor, etc. Second reason could be you overstuffed your system with applications some of it you don’t even use. Why fake speed by disabling msconfig, just to let people believe the system is running faster. Over the years of my IT experience, I had a lot about this scenario, end-users complaining because their software or Operating Systems are not running as it should only to find out that the technician they hired disabled msconfig. How amateur that is. My opinion is, if you do want your OS to run smooth, pack in more hardware resources, increase the memory, if you have 512mb why not get 2gb, why not upgrade the processor? or the buy a faster running hard drive. or remove the softwares that you don’t use, I bet in every PC, there will be one or two softwares installed that are not in use. The honest me tells that msconfig has many things to do and disabling it would cause more problems than solutions. In fact, it’s not a sound solution at all. I might accept the idea if you are troubleshooting or isolating startup problem, but you have to return it to its Normal state afterwards. Don’t disable it forever. If softwares are getting in the way during boot ups remove it or at least google your way to find a solution for the problem. Check for updates, find permanent solutions rather than kill msconfig. I am sure we can do better than killing the little app and consider the issue fixed. No. Unacceptable. Want to figure out msconfig? check here. Cloud computing is a style of computing in which dynamically scalable and often virtualized resources are provided as a service over the Internet. Users need not have knowledge of, expertise in, or control over the technology infrastructure in the “cloud” that supports them. I felt the urge to define Cloud Computing first before I say anything. This computing style may seem new and hype but it isn’t, what I mean is, it has been around for sometime. Computer security is primary. With the advent of viruses, spams, trojans and malwares there is no reason not to protect your computer. And speaking of protection, one way to deal it with is by installing an Anti-virus (AV) or an AV with a firewall. Panda Antivirus is planning to change the game with their recent release of a cloud computing based AV. Conventionally, AVs are locally installed on our PCs pulling out anti-virus signatures periodically from the servers of the AV vendor. Panda has a different approach, they give you a client AV application, allow the client to connect to their servers where the signatures are hosted and let their servers manage the protection of your PC from their side allowing you to enjoy reduced resource usage. A bit clever, right? Panda Cloud Antivirus is at the same time free and a well supported application and for that I am impressed. Avast and AVG have free versions alike but I like the twist Panda Cloud has. Its easy, free and pretty straight-forward. Installation and setup is a breeze. Plain and direct. No adwares considering that it’s free. Updates not required, less nagging. Panda Cloud is a silent killer. It doesn’t nag you at all. Sits right on your taskbar, once installed it goes to work right away. Panda Cloud relies much on Internet connection, why? The app natively is cloud based. It needs to connect with Panda servers to optimally protect your PC. I have made a little research on this because I was threatened specifically on this point – What will happen if I disconnect from the world wide web? Will the app continue to protect my PC? And the answer is, Yes. What happens if my computer is not connected to the Internet? Panda Cloud Antivirus is a security service that protects your computer thanks mainly to the Collective Intelligence hosted on our servers. So, in order to take full advantage of the detection capacity of Panda Cloud Antivirus, your computer must be connected to the Internet. Otherwise you cannot connect to our servers. Nevertheless, this does not mean that Panda Cloud Antivirus will not protect your computer when you are not connected to the Internet. In this case, Panda Cloud Antivirus will protect your computer against the most common threats in circulation. Free version is promised even if the application comes out of Beta, that, hell is good news. Free! Honestly, this security software has not reached the Number One Anti-virus rank, yet. But I like it and I like the maker too. One for being innovative, two for allowing the application to be free which makes me wonder how they will get revenues out of the venture – that one is not for me to talk about, I think. The website is here if you want to dig deeper. More on CLOUD COMPUTING is here, provided by Wikipedia. As usual, the app maybe downloaded from our download links page. And I am done. I hope you enjoyed. Thanks for reading. Information coming from windowsteamblog.com, a site that takes forever to load on my browser, has it that Windows 7 (Microsoft’s newest OS) has reached the release to manufacturing status. That said, this would mean that Windows 7 (build 7600) is close to reaching the shelves where it is expected to sell on the 22nd of October this year. I don’t know if I can consider myself lucky for the chance to test drive Windows 7. The humble me tells that there is little to be excited about Windows 7 (that is my own opinion). I don’t find it revolutionary. I don’t also expect myself to rip off my Ubuntu Jaunty just for Windows 7. Besides Ubuntu is free. Pity the poor IT guy. Thanks Ubuntu for giving me the desktop version via download and for shipping me a copy of the Server Edition for free. And… thank you so much for continuously updating my Ubuntu without asking me a dime. For a quick look on Windows 7 features check here. You have my word, this one loads faster than the windows team blog which takes 7 years to load on Firefox, haven’t tried Internet Explorer 8 though. Many are calling Windows 7 as the real Service Pack of Vista, I seem to agree on this. Really, it does feel like you are on Vista when you are inside Windows 7. It had taken me long before I switched to Vista. I hanged on to old Windows XP for quite a long time. I was so pissed off with Vista before but with the release of Service Packs 1 and 2, I finally used it. That is where Microsoft is good, Service Packs. It’s has been always their natural trend. They release an OS that is buggy at first then they follow-up with Service Packs until it becomes stable. I assume the curve will be the same, hardware and third-party software vendors will catch up a bit later than Seven’s release, so if you buy the new OS immediately chances are some of your PC‘s hardware and your favorite software are not yet supported. The better way, if you want Seven like falling for your high school or college crush is to wait for it to mature a little, that way you two can get together well. So, be patient and wait. I am not a hater of Windows, not a lover either. As a matter of fact, it is the platform that I am using now while writing this article. I expect new PCs will ship with Seven, more so with Notebooks and signature desktops, some people are saying (mostly Microsoft folks) that Seven is also good for touch capable/enabled devices and netbooks. This, by the way, was the thing Vista was never able to make, penetrate the netbook class computer. Well, let us see, I have not tried Seven on a netbook but I am equally excited as you are to see Seven doing well on a netbook. Sun Virtualbox – Commercial grade virtualization for free! Okay cut it. Let us make it simple. Virtualization in simple terms is running another Operating System (OS) on top of your current OS. For an example, if you have Windows Vista, a virtualization software like Sun’s Virtualbox will allow another OS, say Ubuntu Linux to co-exist using resources such as disk space, memory, video as you like. Woot? How is that possible? Sun Virtualbox, Amigo. Of course, there is also wubi for Ubuntu or LiveCd but these are beyond our topic. For this article’s purpose we will only discuss Sun’s Virtualbox. I find virtualization a clever idea. Who could have thought that we could run two Operating Systems (i.e. Vista and Ubuntu Linux) using the same resource, running at the same time! There are a lot of software packages out there that can do virtualization, most famous among which is VMware, but we will take up here Sun’s package, Virtualbox, Sun’s very own hypervisor, since we only like freeware. Why? It’s free, enough said (laughs). Virtualbox is a serious product, it sure does mean business. Coming from Sun Microsystem’s mouth, it is the only virtualization product that is at the same time professional, commercial-grade and open-source. On this, I couldn’t agree more, they’re right. Modularity. Natively Virtualbox dons a software design that is modular. If you are a developer that wants to tinker the software this one is for you. With the Software Development Kit that comes with the software, there is no need to hack the system, you can write your own interface on the fly. This feature also allows ease of control, you can start your virtual machine by Graphical User Interface (GUI) mode or via Command-Line Interface (CLI), locally or remotely. Seems fun, right? Virtual Machine descriptions via XML. Settings, configurations are stored on XML, independently. Ergo, we can port our XML configurations to new virtual machines, also… on the fly. Now this is getting more fun. Guest Additions for Windows and Linux. Guest Additions is a special software that can be installed on the virtual machine to accommodate seamless integration with the host OS which includes mouse pointer and arbitrary screen resolutions. I told you, this is good. Shared Folders. Additionally, hosts and guest may share directories as “shared folders”. Sharing can be accessed from the virtual machines. Virtual USB controllers/USB over RDP. Connect usb devices on the host and make it available to guest virtual machines. Remote Desktop Protocol. As a Network Administrator, I like this feature so much. Ease of administration, I guess. Virtualbox sports the RDP feature, remote access is like heaven if you are an IT admin. This means that you don’t have to go physically to where your server or workstation is. Stay where you are, connect to the network and click your way to your virtual machine, simple and easy. One real-life use of Virtualbox is optimization of servers. Gone are the days that you dedicate one service to one server, like running Active Directory (alone) on one server. Nowadays, where servers have become monster computers running one service would certainly mean that you are underestimating your machine. Try to optimize by using Virtualbox and adding more services. Server consolidation is one great thing Virtualbox can offer. And, there you have it, Sun Virtualbox, commercial-grade, full-featured and free hypervisor solution. Honestly, there is no reason really why you should not try this software, after all it is free. If you want to know more about virtualization, head your way to this info at wikipedia.com. Thanks everybody. Our blog reaches 500 visits, that for me is reason enough to be happy. To those who visited this blog, Thank you soooo much. And… an issue that was making 3.5 version long time to load. The action was really fast. Sure, we always like that kind of receptiveness from a software company. We have seen how Mozilla tackled this problem and how they immediately resolved the issue. I assume this puts the dot ending the issue. The complete list of changes made in Firefox 3.5.1 is here. As usual, a link of the fresh and crispy copy of Firefox 3.5.1 version has been available at our downloads link page.